A synergistic blend of whole herbs for the immune system & cold weather season. Ingredients: Bayberry Bark, Ginger Root, White Pine Bark, Cloves Whole & Cayenne Pepper. During winter we are usually stuck inside, with lots of sniffling & sneezing people breathing the same air. It's important this time of year to get rest, wash hands frequently, drink plenty of fluids & you may escape the winter season unscathed. 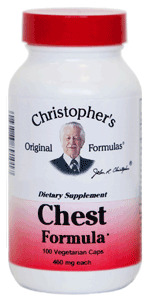 Dr. Christopher's Chest Formula is full of herbs that supports the body's immune system & is great for the cold season. Also available in Powder (Herbal Composition) form.